Mabel Mercer was one of the most important jazz cabaret singers of the 20th Century. Her personal singing style emphasizing interpretation, diction, lyrics, and projection over vocal proficiency influenced numerous leading singers including Billie Holiday, Frank Sinatra, Nat “King” Cole, Lena Horne, Tony Bennett, Rosemary Clooney, Johnny Mathis, and Barbra Streisand. Mabel Alice Wadham was born on February 3, 1900 in Burton-on-Trent, Staffordshire, England. Her unmarried teenage Anglo-Welsh mother, Emily Mame Wadham, was a music hall actress and singer, and her father, Benjamin Mercer, was reported to have been an itinerant black American musician. Taking on her father’s surname, Mercer left school at age 14 to join her aunt’s vaudeville ensemble. In 1916 she joined African American impresario Will Garland’s troupe Couloured Society, which featured an all-black cast of singers, dancers, and comedians. For years Mercer traveled throughout England and Europe as a music hall dancer and chorus singer. In 1928 she got a small part in the London premiere of the musical Show Boat, which starred Paul Robeson. Eventually settling in Paris, France, Mercer was hired by Ada “Bricktop” Smith for an engagement that lasted from 1931 through 1938. Bricktop’s Café was a nightclub patronized by a famous international clientele which included Ernest Hemingway, Cole Porter, Josephine Baker, Gertrude Stein, F. Scott Fitzgerald, and Duke Ellington. With Europe drifting toward World War II, in 1938 Mercer left Paris for the United States. After fulfilling an engagement in the Bahamas in 1941 Mercer was initially refused entry in the U.S. Needing an entry visa from the U.S. government, she entered a marriage of convenience with Kelsey Pharr, an openly gay, black member of The Delta Rhythm Boys. Mercer never lived with Pharr, but as a devout Catholic she refused to divorce him and remained legally married to him until his death in 1961. Mercer became a U.S. citizen in 1952. 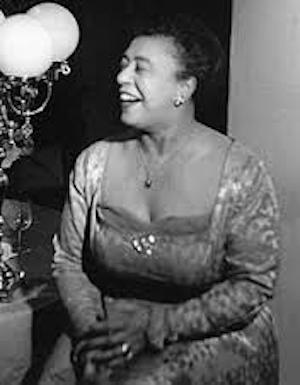 In 1942 Mercer began her recording career with an album of excerpts from the musical Porgy and Bess. For the next four decades Mercer mainly performed songs of major theatrical productions at major nightclubs and cabarets in Manhattan. In the late 1960s Mercer gave two concerts in New York City, New York with Bobby Short, recorded in two albums by Atlantic Records (Bobby Short at Town Hall in New York City, and Mabel Mercer & Bobby Short at Town Hall, in 1968 and 1969, respectively). In the early 1970s Mercer performed to sell-out crowds in San Francisco and Los Angeles, both in California, and in London. In 1977 she starred in the BBC five-part special, Miss Mercer in Mayfair. Mercer received two honorary Doctor of Music degrees, one from Berklee College of Music in 1975 and another from the New England Conservatory of Music in Massachusetts in 1980. In 1983, a year before she died, Mercer traveled to the White House to receive the Presidential Medal of Freedom from President Ronald Reagan, the highest award given to a civilian. Mabel Mercer died in Pittsville, Massachusetts on April 20, 1984. She was 84 years old. She left no close survivors but her legacy lives on today through the Mercer Foundation which produces an annual Cabaret Convention to showcase promising cabaret singers. Darlene Clark Hine, Black Women in America: An Historical Encyclopedia (New York: Carlson Publishing Inc., 1993); John S. Wilson, “Mabel Mercer, Phraser of Songs, Dies,” New York Times, April 21, 1984; Terry Teachout, “Music; Mabel Mercer: The Subtle Truth,” New York Times, January 6, 2002; Stephen Bourne, Black Poppies: Britain's Black Community and the Great War (Stroud, England: The History Press, 2014). Community and the Great War (Stroud, England: The History Press, 2014).